Every Field Day is an adventure, but this year’s event was shaping up to be more of an adventure than usual. 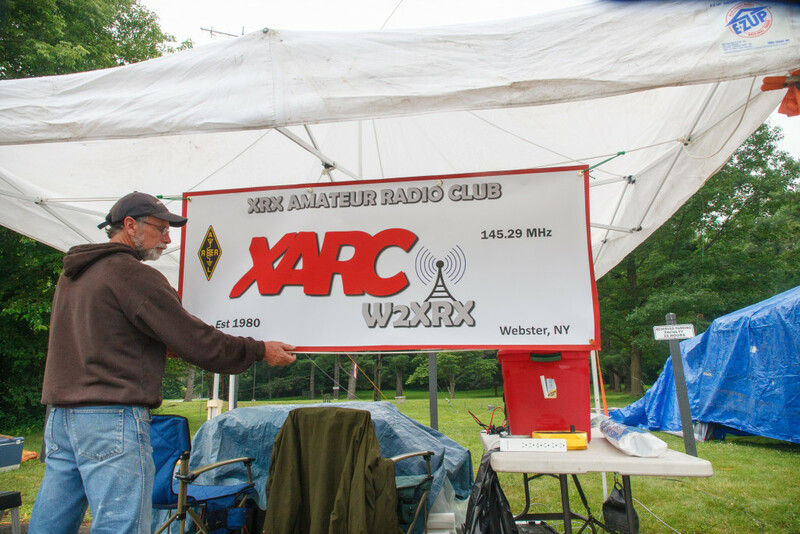 The XRX Amateur Radio Club (formerly the Xerox ARC) has been taking part in the ARRL’s annual civil defense exercise (masquerading as a contest/24 hour social event) for nearly 30 years. In a more “normal” year, we’ve come to rely on club members to bring the tribander and portable tower, the logging computers, wireless network, electrical distribution system and camper, and even the generator. None of these folks would be joining us this year. In addition, we would be missing some of our most experienced operators. 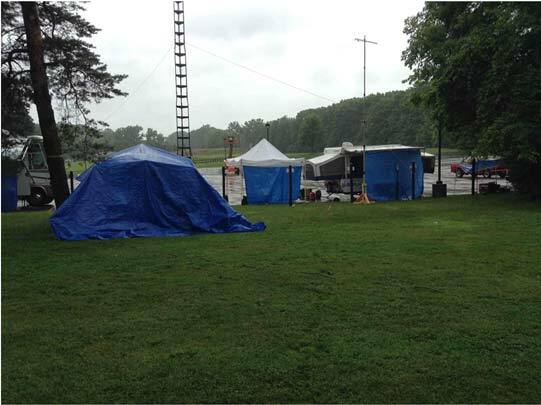 Among my concerns as Chair of the XRX FD effort was rain. Tents and tarps are not particularly waterproof, and that was all we would have. Ominously, the forecast was not just for rain, but for flash floods as well. Therefore I welcomed an e-mail from Paul Conaway, KD2DO, asking if the Monroe County ARES/RACES could join us. They were expecting light participation at their Field Day as was the XRX club, so it seemed like a good match. We started organizing early in June, and despite the missing members, the Field Day spirit in both clubs quickly became evident. On the XRX side, Bill Hopkins, AA2YV, again secured use of Nazareth College as our Field Day site. It’s an excellent venue including a large field with just enough trees for our wire antennas and an adjacent parking lot. Restroom facilities were nearby, and we could claim our usual bonus for operating from a public place. 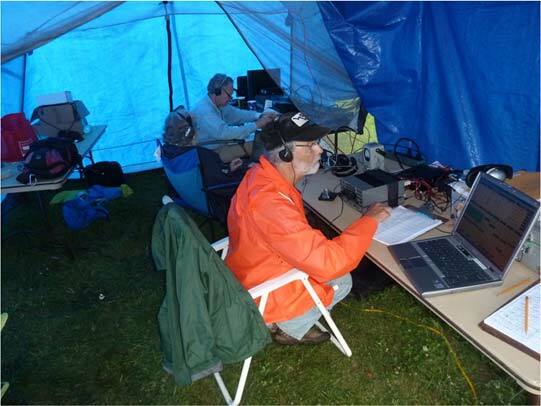 Forest Shick, WA2MZG, volunteered to manage the club’s wireless network, a job that would be new to him. Peter Fournia, W2SKY, volunteered his pickup truck to bring the generator, and Harry Ramos, W2HRY, and Jared Jackson, KC2KPG volunteered to transport the portable tower, tribander and a VHF tower to the site. I had a concern about Harry because he was to return from a business trip to Japan the day before the event. On the ARES side, Paul Conaway, KD2DO, surveyed the Nazareth parking lot to determine just what light poles to use in the parking lot to put his 160 meter loop (a new band for us). In addition, Paul brought an air cannon that proved most effective in raising wire antennas. 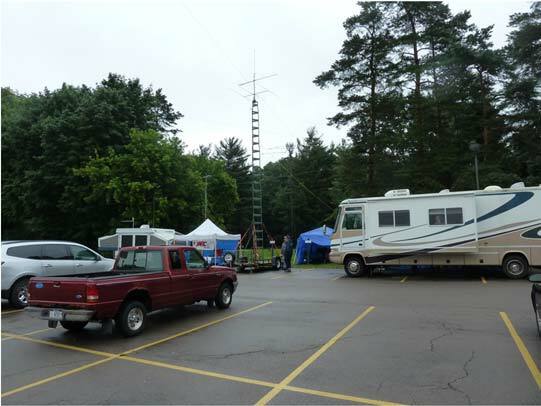 The ARES club also brought several other antennas and rigs, and most welcome of all, tents and pop up campers. The Saturday morning of Field Day dawned cloudy, but it was not yet raining. Maybe the dire forecast would prove wrong. Everyone was supposed to assemble at 10:00AM for set up. The XRX crew typically shows up late and has to hustle to catch up, so I was pleasantly surprised when I pulled in to see a crowd (12 of us, half from each club) already there and working including a jet lagged Harry Ramos. We needed just about everyone present to raise the 35 foot vhf tower which was already assembled and very heavy. At about 10:30 it started to sprinkle just as Dave Carlson, KA2OQZ, arrived with another unexpected surprise – a rather large motor home. At least we would have someplace dry for the radios and computers if the worst happened. As the intensity of the precipitation increased, one team worked to put up some craft fair style shelters while three of us were trying to put up a rather large tarp donated by Jay Golden, K2JSG. Things just were not working out. We had doubts about how waterproof the shelters would be during the predicted deluge, and we were having difficulty stretching the tarp between trees. In desperation, we threw the tarp over the two shelters making an ugly but large and waterproof space for two rigs (see pictures). The deluge did indeed come, but those rigs stayed completely dry. The tribander, VHF tower, and 160 meter loop were all up before the heavier rain arrived, but not so for the wire antennas, and Bill Hopkins, AA2YV, absent rain gear was thoroughly soaked. His helpers were better prepared for the weather and fared a bit better. As set up continued we had the usual problems (a logging computer glitch, a bad piece of coax, a faulty antenna analyzer, feedline for the tribander not attached to the tower, etc. ), but we were on the air and making contacts by 2:15, only 15 minutes after official start. Soon after that Anand Choudri, KC2KPG, bought lunch for everyone including two large pizzas and sandwiches….Thanks Anand!! Our set up consisted of a VHF station in one pop up trailer, two HF stations under the tarp, one HF station in another pop up, and another HF station under the awning of the motor home. We operated Class 3A for a club operation with three HF transmitters operating simultaneously. The fourth HF station is a “Get on the Air” or GOTA station reserved for inactive or new hams and visitors. The GOTA station has its own call sign and does not change our classification. The VHF station, not being HF is likewise “free”. For the next 24 hours we continued to make contacts, and it continued to rain, sometimes heavily and sometimes lightly, but always rain. It was our wettest Field Day by far. Fortunately the only thunder and wind occurred briefly in the middle of the night with no damage. Highlights of our operation were two contacts by Christian Stewart (age 7) and one by Natania Reid (age 9) and visits by Monroe County Assistant Public Safety Communications Director James Herbst, KC2KNJ and former RARA president Duane Fregoe, K2SI. The rain finally ended just in time for take down at 2PM Sunday which took about 2 hours. So how did we do? We had 28 participants. We made 794 QSOs including 29 Digital, 411 CW, and 354 Phone. We also earned 1090 bonus points for items such as 5 “natural power” (e.g. solar) QSOs, copying the Field Day Bulletin, and having young operators each make at least one QSO. We project that our total score will be 3558 points. Based on previous years, we expect to finish in the top 30%. Most importantly, the two clubs got to know each other, learned quite a bit about each others operating practices and techniques, and had lots of (wet) fun. All agreed that we work well together, and we’re looking forward to doing it again next year when hopefully it will be dryer. Our Field Day is open to all, not just members or either club. So if you haven’t experienced a Field Day or are looking for a group to join, consider being part of our next Field Day effort June 25-26, 2016. This looks interesting. 2m, 220, and 440 capability. The bandpass filters were previously installed at the Xerox Tower site. Mike Ishler KE2LU donated the RF Concepts amplifier. Thanks Mike! I had no serious test equipment, but everything seemed to be working. The repeater is set to 20 watts, and according to my MFJ VHF Wattmeter/SWR meter, the amplifier is putting out around 80 watts. The amp is not designed for repeater duty, but we are only running it about half rated power. It has temperature protection, but I want to get a fan on it. Initial reports are good. I’ve had a few QSOs, including one with Harry W2HRY, just using an HT in my shack at home, about 39 miles from the repeater. On my 2 meter mobile in my shack, it went from 1/2 scale on the s-meter to one notch from full scale. Mike W2HYP had no trouble using an HT from the U of R just after I made the changes. The addition of the preamp changed the squelch action, so I did my best picking the right level. The squelch has always been questionable, so additional tweaking may be necessary, including an internal “threshold” adjustment. If you get a chance, see how it is working for you, especially if you had some problem areas where it was marginal. If things seem to be good, Fred Miller WO2P has agreed to help package things up in the repeater cabinet. If you have an FTM-400, they have released new firmware. The only major change I know of is release of programming software for the memory, which is supported in the new firmware. I have updated mine, not too difficult. All SW and instructions on the Yaesu site. Glad I didn’t buy that 3rd party programming software yet. The Yaesu software works fine. A few years back I had kept seeing ads for Anderson Power Poles, and it seemed like I was missing the boat on these new connectors, which offered up to 30 amps in a handy configuration that offered some standardization in DC power connectors. So thinking I was missing out on a new standard, I ordered some and began slowly converting some of my connectors. I can’t say I saw anything special about them, and wondered if there was any advantage in them other than standardization. But I never did any testing, or stressing of them. I was watching HamNation Episode 203 on YouTube last week, and Gordon West WB6NOA was doing a review of Field Day and had unfavorable things to say about problems they had with Power poles. Connectors breaking, voltage drops – he said despite their rating, they shouldn’t be used at anything more than 10 amps.